You would need a BBVA Compass Routing Number when trying to setup an automatic draft, sending wire transfers, direct deposits or other transnational services. 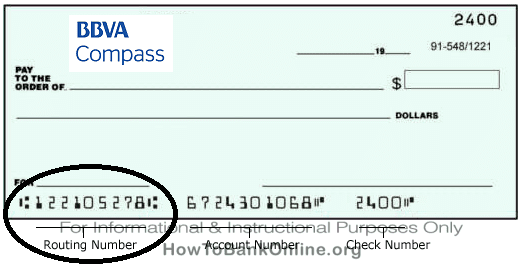 The Routing number is printed on your BBVA Compass check at the bottom left corner it is a 9-digit number which usually is different for every BBVA Compass branches. You can verify these on the banks official website Routing Number. For international wire transfers which involves receiving foreign currency funds in your BBVA Bank account you may require the following details which should be entered correctly. This information can be verified in this document.